Official press release can be downloaded here. 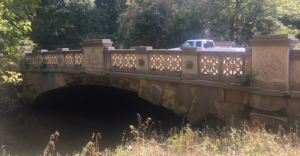 LOUISVILLE, KY (Feb. 4, 2019) – The Kentucky Transportation Cabinet (KYTC) recently awarded a contract for rehabilitation of the Bernheim Bridge in Cherokee Park in Louisville. This bridge, also known as Bridge No. 8, crosses the Middle Fork of Beargrass Creek. This project includes waterproofing and repairing the concrete arch, resetting the railings, masonry repairs on the spandrel walls and railings and new asphalt pavement on the crossing. KYTC is coordinating the bridge repairs with Louisville Parks and Recreation and Olmsted Parks Conservancy. Construction is scheduled to begin this week. The bridge crossing via Beargrass Road from Park Boundary Road and Alta Vista Road will be inaccessible through the duration of the project. The Bernheim Bridge will reopen to traffic in late summer. Several popular nearby park features, including Big Rock pavilion, parking and playground area, will be easily accessible during the construction period. 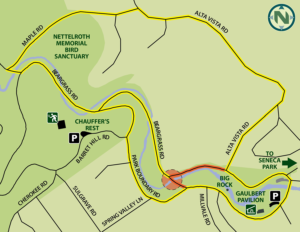 A detour map can be viewed below. Louisville Paving Company was awarded the $1.1 million construction contract. Marr Construction will be the subcontractor for the masonry rehabilitation of the historic bridge. Marr has worked on several other bridge restoration projects in Cherokee Park. The Bernheim Bridge dates to 1928 and was named for Bernhard and Rosa Bernheim, who were members of the notable Bernheim family that includes Isaac Wolfe Bernheim, who founded the Bernheim Arboretum and Research Forest south of Louisville. Another bridge in Cherokee Park on the Scenic Loop is scheduled for repairs later this year. These bridges are part of KYTC’s Bridging Kentucky program. Bridging Kentucky includes more than 1,000 state, county, and municipal structures that are rated in poor condition or have restricted weight limits. More than 70 of the bridges on the list are currently closed to traffic. Each bridge will be addressed in the next six years, either replaced with a new structure designed to last at least 75 years or rehabilitated to extend its life by at least 30 years. Those with restricted weight limits will reopen to school buses, emergency vehicles, commercial trucks, as well as passenger vehicles. The date and duration of this work may be adjusted if inclement weather or other unforeseen delays occur. Visit goky.ky.gov for the latest in traffic and travel information in the Commonwealth of Kentucky. Traffic information for the District 5 counties is also available at facebook.com/KYTCDistrict5 and twitter.com/KYTCDistrict5 . Navigate traffic with KYTC, www.goky.ky.gov , and Waze, www.waze.com!